You get lots of traffic, even when you don’t post for a whole month. Seriously, am I a rotten blogger or what? In general I haven’t been slacking, though, just here. In the last few weeks we’ve had a smattering of Mystery Illness, the beginning of school, a web site launch, intermittent knitting and dyestock mixing, and a death in the family. So the blog, it suffers. 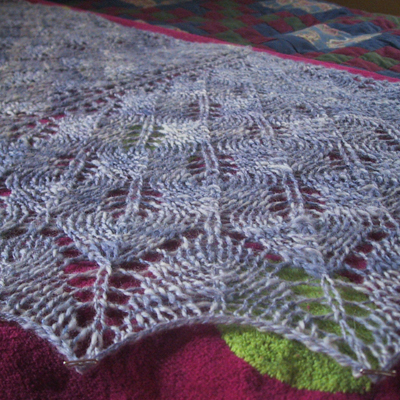 I love this pattern, and I love this yarn. There’s another pic here — no, it’s not that big, it’s being modeled by my six-year old. I’m not so sure about that edging. But for now, I’m not going to worry about it. This is the part where I knit the sleeves, then decide the whole thing is wonky (despite having tried it on a zillion times) and rip it all out. Stay tuned. Coming soon: a cabled earflap hat pattern. Swatching is in progress! 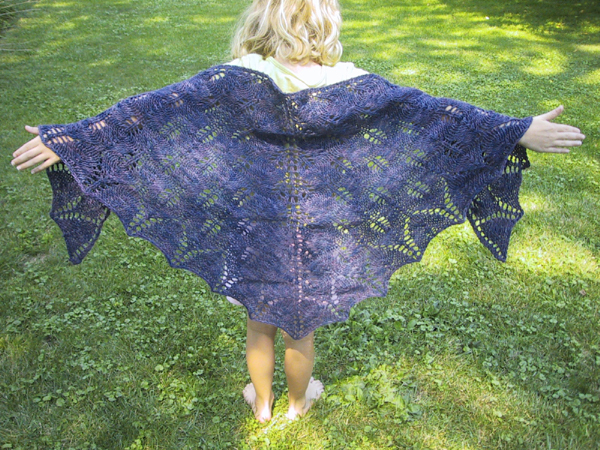 The allure of lace knitting, that is…the magic of blocking…. 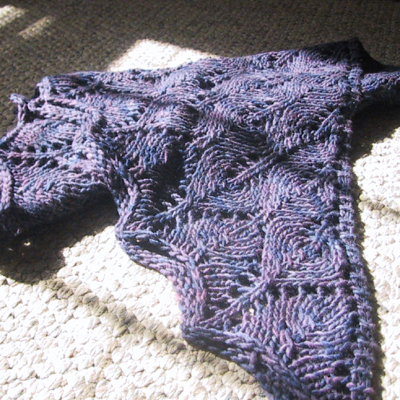 Knit with my own handspun (BFL/silk) on US10 needles. I think I started with a little over 300 yards. Or something like that. DK-ish. I only did 7 body repeats because I was nearing the end of the yarn. 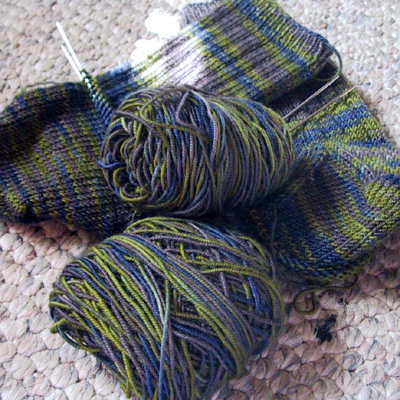 And was I ever…I had 3g of yarn left when I was finished! I did something courageous, too — well, I didn’t have anything to lose, so maybe courageous isn’t the word, but still — I had knit the 8th repeat without moving my lifeline. 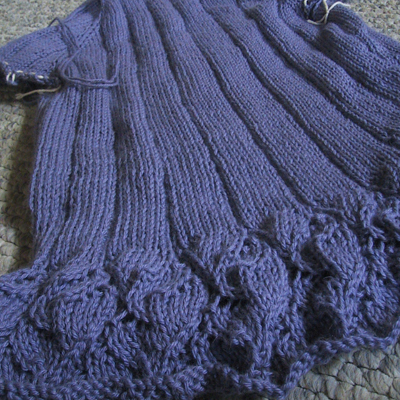 When I started the edge chart and realized I’d be short, I didn’t want to have to rip back to the 6th repeat, so I carefully ripped ten rows and actually got all the stitches back on the needles. All seventy-billion of them, yarn-overs and everything. Go me.